Using the Everyone’s Environment funds, the team have been weeding at Fay Smith Wetlands in Maryborough (assisted by Conservation Volunteers Australia and Wildlife Preservation Society of Queensland – Fraser Coast), removing species including Cassia, Broad Leaf Pepper, Asparagus Fern, Silver-Leaf Desmodium. Along the Hervey Bay foreshore Broad Leaf Pepper and Asparagus Fern have been removed. On Round Island, the team have removed Broad Leaf Pepper, Prickly Pear, Green Panic grass, Periwinkle and Corky Passion Vine. 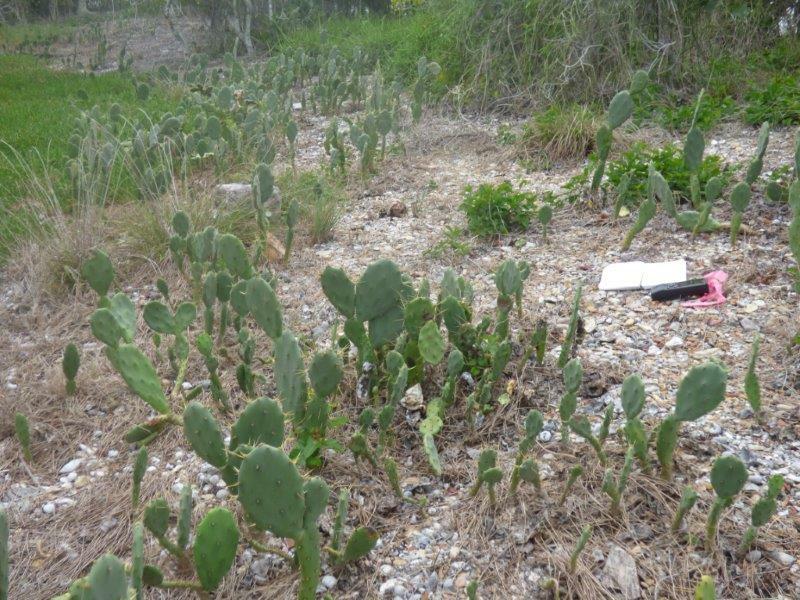 The team also undertook reconnaissance and experiments on Prickly Pear on Picnic, Little Woody, Duck and Big Woody Islands. Marine debris collection was also undertaken on islands visited. Helping LMRLCCG were Fraser Coast Regional Council, Conservation Volunteers Australia – Fraser Coast, Fraser Coast Regional Council’s Community Environment Program, Wildlife Preservation Society of Queensland and volunteer groups. The group also supported a number of awareness activities including turtle information/training with the Probus Club, World Environment Day, State School visits (including a weed education trip to Round Island with students from Torquay State School and led by Juliet Musgrave of Fraser Coast Regional Council) and the “From the River to the Sea Forum” on 8 March (the latter funded by an Everyone’s Environment grant and supported by the Burnett Mary Regional Group and Safety Shop). Monitoring was on the agenda with the Queensland Wader Study Group shorebird survey in December and River Heads turtle monitoring in April. 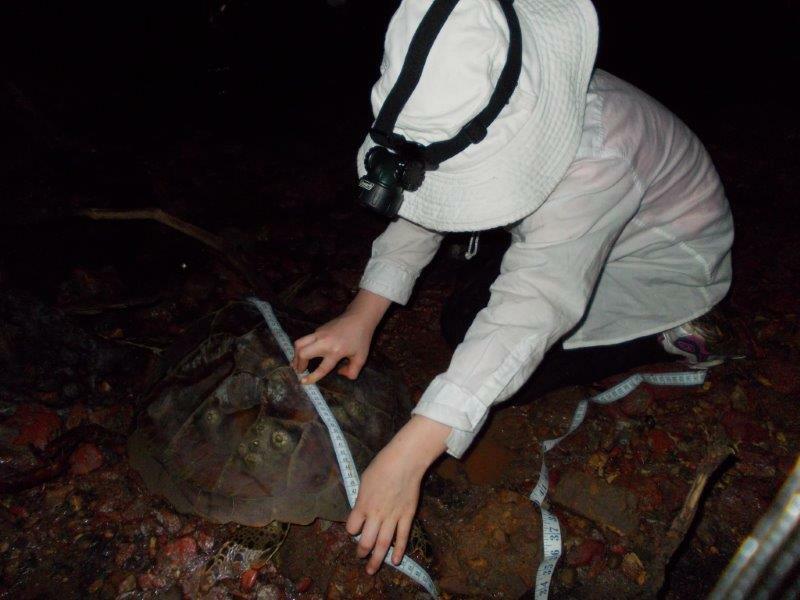 Turtle monitoring session at River Heads. From the back Jason, Peter, Charlotte, Anna (scribing), Jeff and Aub (bending over reading the tag). 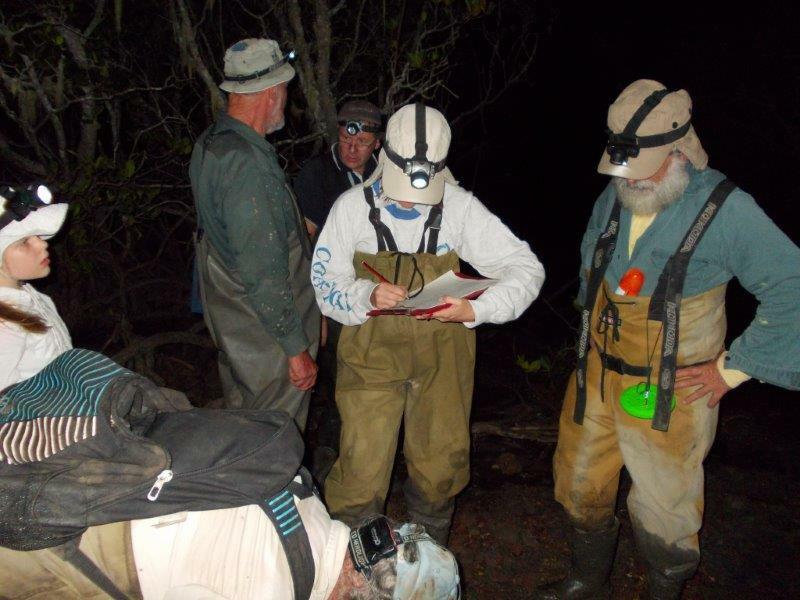 98 turtles were monitored in the creek that night with 111 turtles the night before. Finally, the LMRLCCG group also reconnoitred Big Woody Island North Bluff lighthouse site with Gavin Patterson and group and now plan to walk the telegraph line from Middle Bluff lighthouse to Jeffrey’s Beach with QPWS in May. Don and Lesley Bradley, LMRLCCG. By finiaadmin in Burnett Mary Regional Group, Conservation Volunteers Australia, Fraser Coast Regional Council, Volunteers, Weed and Pest Management on May 20, 2014 .